Ray-Man offers three different discharge styles. The CHII-SF (pictured) is a traditional, side-discharge tender, while the CHII-FB overhead discharge tender can rotate 270 degrees. 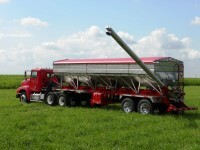 The CHII-CB can be used to transfer fertilizer or grain and is gentle enough to handle seed. Ray-Man offers two grades of stainless steel, split compartments, full-length top catwalks, as well as manual or electric roll tarps. Charger II truck mount tenders are built from 12 to 24 feet with multiple compartments. The full-length hopper sub-frame keeps the cones at their full 40-degree angle to ensure maximum cleanout and to keep operators safely on the ground. Charger II semi-trailer tenders are available 30 feet long with five compartments; 36 feet with six compartments; or 42 feet with seven compartments. The integral trailer framework utilizes the hopper sub-frame, tubular steel “X” bracing, and the main frame rails to achieve a superior strength to weight ratio.